Following on from the last instalment of ‘InstaHAM’ I have a new selection of goodness to show you. As you know I simply cannot help but try new things. No matter how poverty stricken I am I will always scrape together the pennies to make my taste buds happy. And this week, wow, they were more than happy, they were utterly confused. More confused in fact than my eyes and ears were seeing the Britney Spears video for ‘Work’ for the first time the other day. (what the HELL is that song and video… I can’t even….) Christmas is a great time for new and exciting food products on the shelves and these Limited Edition Pringles are no exception…. So, these Pringles eh, they’re certainly a bit odd. I did see people mentioning them on Twitter and the like but assumed they were an American version or something. When I went to Sainsbury’s and saw them in the real life though I was quite excited, if not a little apprehensive about what they’d actually be like. For some reason I assumed they might actually be chocolate and not crisps, you know like those Belgian Chocolate Thins you can get, but nope. they’re crisps alright! The same texture and that of regular Pringles but without the savoury flavourings. Are they nice? Hmmm I’m still undecided. 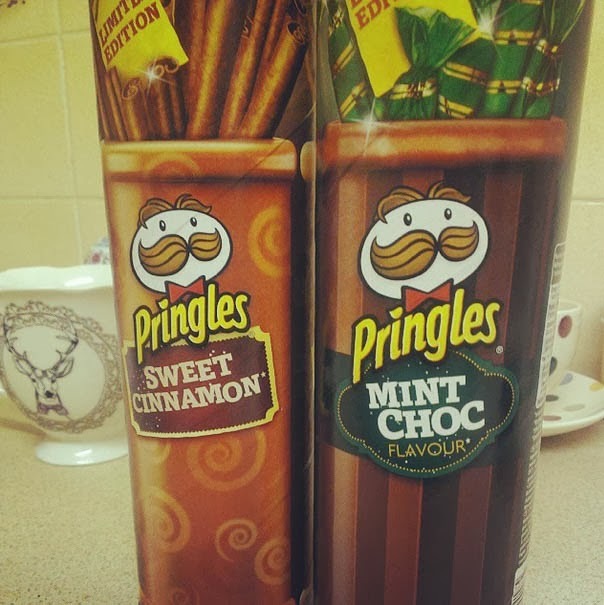 The Mint Choc ones kind of work the best and the minty taste is almost refreshing, but they don’t have that ‘moreish’ effect a regular tube of Pringles has. I can totally understand the method in the madness with these, as a lot of the time after chocolate I fancy some crisps, but this just cuts out the middle man. I don’t think it’s better than actual chocolate then crisps though, but they’re alright. The Sweet Cinnamon ones are the same – not gross, but they definitely don’t have that ‘once you pop you can’t stop’ thing going on. When you’re chewing them you feel like you want something more! It’s kind of misleading as it TASTES like you should be eating a nice big, soft, warm pretzel but you’re actually eating… a Pringle. They’re definitely both flavours you should try, but not on your own. They’d be great at some kind of party in a bowl to utterly confuse people. At the moment they’re on offer in store as 2 for £3.50. 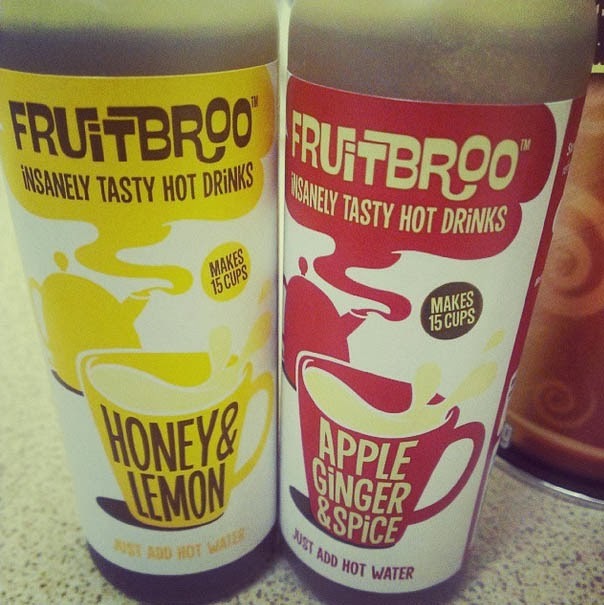 I also picked up these bottles of ‘Fruitbroo’ when in Sainsbury’s too. They only had 2 flavours on the shelves but I hear whispers there are more flavours available. Actually that’s not a whisper at all, the Fruitbroo website confirms there are actually more flavours, and good grief they look delicious…. Why is the Rhubarb, apple and cinnamon not in my life RIGHT NOW??? I was super excited by the Apple Ginger and Spice flavour, but to be honest it wasn’t what I expected. The taste is very very subtle and it’s not as ‘warming’ as you’d hope from a hot ginger spicy beverage. The Honey and Lemon flavour I didn’t think I’d be too keen on. Honey is one of those things I always adore the smell and look of, but the taste is horrid. I am pleased to say that this is actually delicious though. The lemon flavour is quite a tangy one, more like the lemon juice you pop on pancakes than anything, and the honey is a subtle hint within the drink. Both flavours are quite subtle and quite pleasant – very similar to actually having a fruit teabag, but these drinks are in syrup form. I do prefer putting more than the recommended one teaspoon though, as I like my tea strong, like a lion. 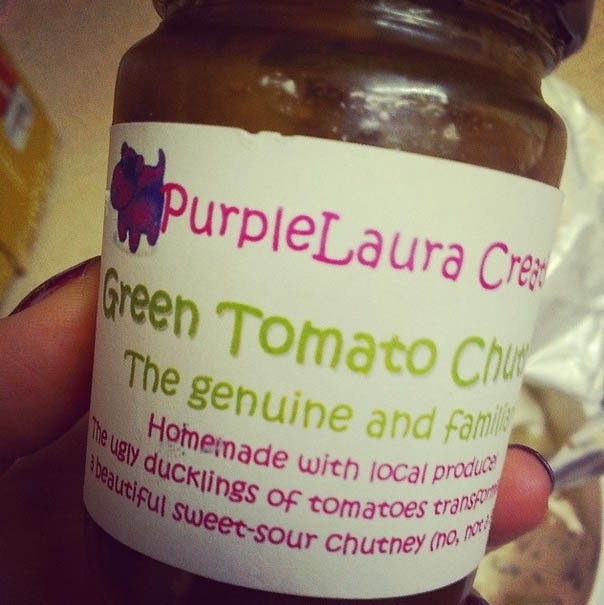 Something else which has been tickling my taste buds this week is this Green Tomato Chutney from a local preserve and cake maker ‘Purple Laura Creations’ which I got from a Cheshire farmers market. I love farmer’s markets, especially for the tasty treats. I wasn’t really sure what appealed to me about this as I’m not the biggest tomato fan in the world ever. But this is such a tangy and sweet flavour it’s a welcome addition to any batch of philidephia and ryvita supper I tell thee. It’s got a lovely fresh taste to it and not that goopy glob overtone which supermarket chutney tends to have. I really liked the cute narrative on the jar too. Sometimes I think I should stop buying items based on their cuteness, but most of the time, like this, it pays off. Yum. Finally, the only meal I’ve actually eaten out this week was the The Harvester. I do enjoy Harvester, especially the salad bar, but this time it was a little disappointing. I couldn’t decide what to have, but I knew I wanted MEAT, hence going to Harvester of course. After a lot of deliberation I chose the Jack Daniel’s BBQ Platter which boasted a steak, ribs, seasoned fries, onion rings and ‘ranchslaw’…. Ranchslaw I can state as being the most disappointing thing on the plate. It was presented quite nicely in a iceberg lettuce leaf (lame thumbs up) and was the most dry and rubbish version of coleslaw I have ever encountered. 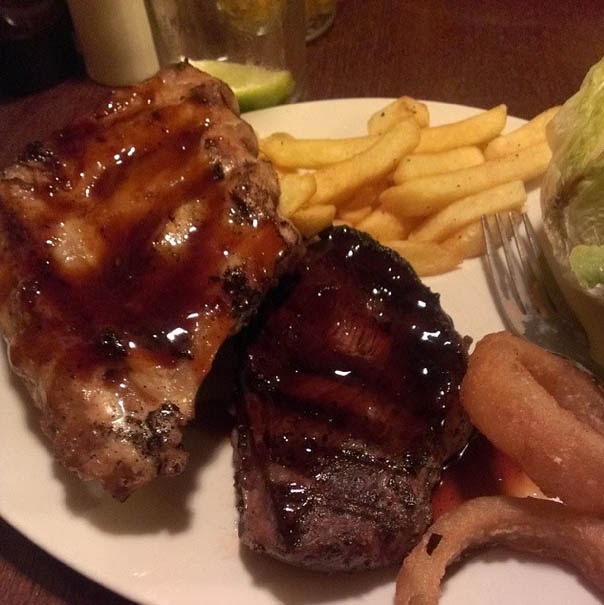 The ribs were ok, and chips were nice (although they must have some kind of ration book in the kitchen, as I got about 10) The steak was so chewy my knife wouldn’t cut through it, let alone could my teeth eat it. In the end, after developing a blister on my thumb through trying to hack through it I gave up. Blah! What have you been chowing down on this week?